Stir-fry Pork Recipe – Eats Yummy! We cooked this good food dish along with the Tinapa Rice as our dinner. Ana and I were not really sure if it blends well with our choice of rice (Tinapa Rice). The good thing is that, it was not only us who liked this easy recipe, but my siblings too. 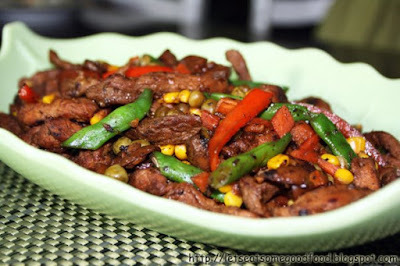 The recipe for stir-fry pork is actually easy to cook and follow, try it out at home now and you will never regret it. Combine soy sauce, honey and garlic in a medium bowl. Add pork strips, mix well and marinade for 15 minutes. Cook the beans in a boiling water until slightly tender-crisp, add salt. Add frozen vegetables and cook for 1 minute. Drain and separate. Heat oil in a wok and stir-fry the pork over high heat until tender. Do not disregard the marinade. Lower the heat and then add bell peppers and mushrooms. Add the pork marinade and vegetables and stir-fry for 2 minutes. A kind of new one for me.!!!!! that is lovly food, I like to eat that, good post with food.